You can learn to grow vegetable gardens right in your own backyard and have fresh vegetables available whenever you want them. Getting started is not that difficult! There are only a few simple steps that you need to follow and you can be well on your way to growing your own vegetables. We've kept the steps simple and easy to understand so that just about anyone can follow them! Learn Your Area: The first step in learning how to grow vegetable gardens is taking the time to learn your own growing area. Every location is different, so growing a vegetable garden in Virginia is a little different than growing a vegetable garden in say Colorado. Take the time to learn what planting zone you are in. This is extremely important for knowing when the first and last frosts will occur. If you plant your vegetable garden too early, a late frost could destroy your hard work. If you plant your garden too late, you won't see the harvest before the first frost of the year sets in. 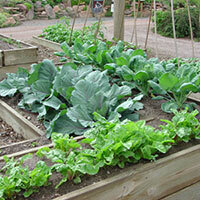 Understanding the weather patterns for your location is critical when growing vegetable gardens. Form a Plan: Some people like to dive right into a project head on and just start digging and planting to get that instant gratification that you've done something. This isn't always the best approach, especially for a vegetable garden that you are hoping to grow food from. Give it some thought and first decide, what would you like to eat from your garden? A vegetable garden isn't much good if you really don't like the food you are growing. So plan it out and consider how fast each vegetable grows. Some take only a few weeks while others take all season. 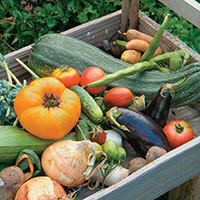 Read our article on companion planting and learn how you can mix and match vegetables to complement one another. 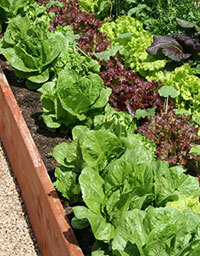 This is just one of many tips on growing vegetable gardens. Choose The Right Seeds and/or Plants: The right seeds and plants can mean the difference between an exceptional vegetable garden, and a mediocre one. 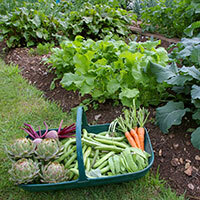 You will want to try and find disease resistant vegetables for your new garden. Make a note of how big each plant will get at maturity so that you can plant them accordingly with other plants to make the most of your available space. It's also a good idea to try and find heirloom varieties of the vegetables and herbs that you are just learning to grow vegetable gardens. Heirloom means that the variety has been grown and cultivated for generations and more than likely is very hardy. Organically grown plants are also in high demand. Two Harvests: A lot of gardeners plant their vegetable, get them to harvest, and then they are done for the year. Now you can certainly do this if you prefer, but you can usually get two growing seasons in most planting zones. Find yourself a selection of cool weather vegetables as well, and learn when to plant them while the rest of your garden is well under way. This way when the first harvest is through, you've still got plants that have yet to bear fruit. This is one of those tips you don't often here about when reading up on growing vegetable gardens. 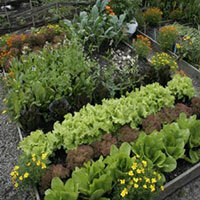 Layout Your Veggie Garden: Here is where the fun part begins! You've spent a great deal of time and research, hopefully, learning how to grow vegetable gardens, and now you get to put all that knowledge into practice! You should have already figured out the size and space requirements of your crops, so now it's time to start planting them. You should have already prepared the soil in advance of the project, if not, read our article on preparing soil for vegetable gardens. Make sure you plant your rows leaving enough space for the plants to reach maturity, as well as any companion planting schemes you may have decided upon. You also need to remember that not everything needs to be grown from seeds! Since you are just learning the basics of how to grow vegetable gardens, you can get many of your herbs and vegetables from local nurseries as starter plants. They've already taken care of germinating the seeds and getting the plants started for you. Now all you have to do is finish the job! Fruits of your labor! : Learning to grow vegetable gardens is more than just a hobby you pick up and do on the weekends. This is something that you can get the entire family involved in, especially your children. Imagine the sense of purpose, and the satisfaction they could have in eating food that they helped grow in the backyard! Now we know that not all children are into eating their vegetables, and even fewer yet will probably be willing to grow them at that, but if you find ways to make the project fun and give them ownership of certain aspects of it, you will find an enjoyable experience can be had by all!